Answer: There’s another Sky Lights about dust devils (with photos and videos) you might want to check out. See my May 23, 2007 post. Both posts explain the physics of an already-formed dust devil, but neither really answers your question. And it’s a great question, since hot air not rising seems to violate the laws of physics. As it turns out, this “violation” is a temporary state of affairs. The graphic shows how the warming air at first gets trapped under a layer of cooler air. When sunlight strikes the ground heat is absorbed and the ground temperature increases. This happens more quickly with darker-colored ground coverings. Here in Arizona, during the summer, the temperature of black asphalt can hit 65-70 °C (150-160 °F). This heat is transferred by conduction to the air immediately above, causing it to warm, expand, and become less dense. This is a highly unstable arrangement, with the warm air trying to rise and the cooler air trying to fall. But (at least initially) the downward force is in balance with the upward force. During this initial equilibrium, you could say the higher-pressure warm air is supporting the weight of the heavier cool air, or you could say the weight of the cool air is preventing the warm air from rising. As the bubble grows larger, this equilibrium becomes harder to maintain. Eventually, convection will begin: warm air will rise and cool air will fall. But before that happens the warmer air spreads by diffusion: the more-rapidly-moving warm air molecules ricochet via multiple collisions into the surrounding cooler air. That’s a slow process since air is a very poor conductor of heat. Still, this creates a temperature gradient (labelled the “shell of diffusion”) where the warm and cool air mix. This gradual transition helps to delay the onset of convection. Of course, net buoyancy also depends on the weight of what is trying to rise. At the scale of the graphic, the warm bubble contains about 50 m3 of air and weighs about 60 kg (130 pounds). It displaces 50 m3 of cool air, which weighs maybe 70 kg (150 pounds). So by Archimedes’ Principle, the warm bubble already feels 10 kg (20 pounds) of lift. 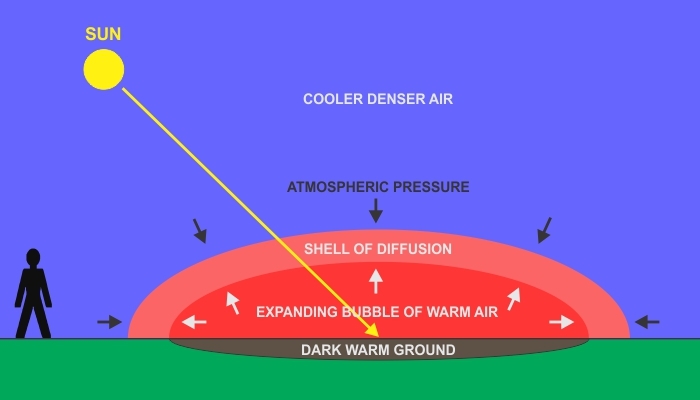 At some point, due to growing instability and increasing lift, the warm bubble breaks through the layer of cool air and begins its ascent, replenished by more hot air from below. This is the start of convection and the triggering point for a dust devil. How large it grows, and what height it attains, depends on the size of the warm air bubble when it “bursts” and how quickly more hot air flows into its base. And as long as I’m returning to this topic, I’ll explain something else that several readers asked about my Feb 1, 2010 post. The graphic shows incoming air converging purely radially, with no curl (rotation or vorticity). See this cool applet demonstrating curl visually. But the graphic also shows the rising air instantly developing rotation as it leaves the ground. Where did that rotation come from? In perfectly still air, with no horizontal winds, a dust devil could form as single upward-moving plume, albeit with some turbulence. But this never happens because air is never perfectly still. There’s always some vorticity. I shot a photo of that effect on wind turbines and used it in my Sep 12, 2011 post. So as new air flows in at the base of the dust devil, this vorticity is “magnified” by the law of conservation of angular momentum. Like a figure skater pulling in their arms and legs, the spin rate increases. See my Jan 26, 2015 post for more about that effect. It’s the cause of the rapid rotation we see in all dust devils.